Last night Home Alone 2: Lost in New York was on TV. Okay, it's a goof of a movie that even Tim Curry couldn't have saved, except that now that we live in New York, we saw it in a different light. It's chilling to see the scene where he's walking toward the former Twin Towers (followed ironically by a sign "Airport Security" in the next scene). It's also fun to point out all the places he visited during Christmas that we similarly visited like also being at Rockefeller Center on Christmas eve. It was actually funny that it was on last night since just the day before, we were at the Plaza Hotel right across from FAO Schwarz (like Duncan's Toy Chest). 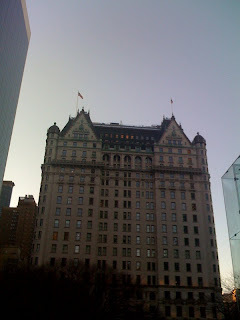 The Plaza is also directly across from the fanciest Apple store in the world (where you have to catch the glass elevator down to the store - think the Willy Wonka ride for techies). Old staring at the fruitful new. The Plaza Hotel is an uber luxury hotel located on Fifth Avenue at Central Park South, and the kind of hotel that we would perhaps love to put our moms in for a few nights so they can get pampered, but not really our cup of tea (we'd feel pretty uncomfortable with the butlers hanging around) despite its regal, majestic elegance. The Plaza Hotel is the only New York City hotel (along with the Waldorf-Astoria) to be designated as a National Historic Landmark. Other movies you can see the Plaza in include Arthur, Almost Famous and The Way We Were, to name a few. But it made its major movie debut in the great 1959 Hitchcock film North by Northwest. Other cool facts about this hotel: This was the first American hotel The Beatles stayed in (during their first visit to the U.S. in 1964) . And although Donald Trump no longer owns it, in 1988 he bought the Plaza for $407.5 million (he said that for the first time in his life, he didn't buy the building for business or economic reasons - he bought it because it's a masterpiece). Finally, can you believe Home Alone 2 was made in 1992? It seemed like just yesterday. Where did time fly?